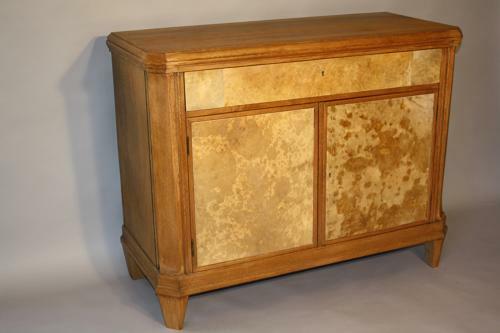 A practical and unusual solid Oak cabinet with parchment covered doors below a single drawer. The natural parchment colours vary slightly with shaded and lighter patches which are a particularly nice feature. The main cabinet shape is architectural in design and feel, with faceted corners and is raised on elegant slightly triangular feet. French c1950. Lockable drawer and cupboard.